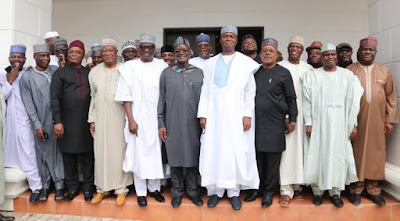 Home » » 2019: Saraki Meets 4 Governors, Top Politicians; To Dump APC? 2019: Saraki Meets 4 Governors, Top Politicians; To Dump APC? The Senate President, Bukola Saraki; the National Chairman of PDP, Uche Secondus; and a presidential aspirant of the PDP, Alhaji Sule Lamido, on Wednesday, held a private meeting in Ilorin, the Kwara State capital, alongside other top politicians. Sources say it's about the 2019 power battle. Saraki had on Tuesday said it was premature for him to declare whether or not he would contest for president in the 2019 general election. While on his first visit to Kwara State since his Code of Conduct Tribunal victory at the Supreme Court, he had also said it was not time for him to declare whether he would defect to the PDP or any other political party from the APC. Other notable politicians who attended the meeting behind closed doors included the Governor of Rivers state Nyesom Wike; Kwara state Abdulfatah Ahmed; their Benue State counterpart, Samuel Ortom; a former PDP Chairman, Alhaji Kawu Baraje, who also led the new PDP bloc of the All Progressives Congress; and the PDP National Publicity Secretary, Kola Ologbondiyan, among others. Also present at the meeting were the Governor of Sokoto State, Alhaji Aminu Tambuwal; Senator Lawal Shuaibu; and Senator Barnabas Gemade. According to sources at the meeting, though some of the politicians had joined the eighth Fidau prayer for Baraje’s late mother, Aishat, they later converged at Saraki’s house, where they were joined by other politicians, including Lamido, Secondus and others who reportedly could not attend the Fidau. The sources said they strategised on the 2019 election politicking. There were also unconfirmed reports that the politicians discussed strategies for the speculated defection of Baraje, Ahmed, Saraki and his loyalists from the APC to the PDP. PDP spokesman, Kola Ologbondiyan, who confirmed the meeting, claimed that though it was a brotherhood meeting, they also discussed political issues. According to him, they discussed how to move Nigeria forward. He said, “It was a brotherhood meeting. Our leaders met and they shared thoughts on the future of Nigeria and how to improve the living condition of Nigerians and how to make Nigeria a better place for all to live in. “It was a convergence of notable Nigerians. Do not forget that the essence of today meeting was to commiserate with Alhaji Baraje on the death of his mother. When politicians meet, they must discuss politics and how to improve on the standard of living of Nigerians. It will not be wrong to say some issues were discussed.